The Plumbing-Heating-Cooling Contractors Association has been helping PHC contractors reach goals for 117 years. PHCC is a diverse group of contractors. Our members operate large, medium, and small companies. They perform work in residential, commercial, industrial and institutional projects; maintain union and open-shops; and engage in maintenance, remodeling, and service and repair. Our Mission: Dedicated to the promotion, advancement, education, and training of the industry, for the protection of our environment and the health, safety, and comfort of society. 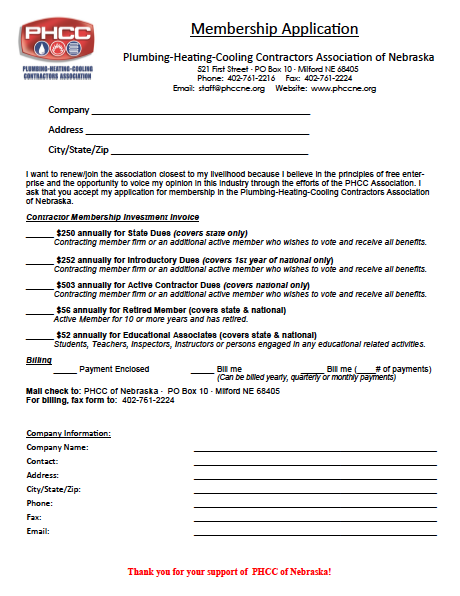 Association Profile: The Plumbing-Heating-Cooling Contractors Association has been helping PHC contractors connect with consumers for years. To find a PHCC of Nebraska member, check out our online Membership Directory Page. PHCC has so much to offer you and we can't wait to connect you to other professionals. Find out more about PHCC events, benefits and other resources by visiting one of the links below. Questions? Just call or email the PHCC staff today! Become A PHCC Member Today! Complete an application to become a member of the PHCC network. You will receive a response from the staff once your application has been received. Help us help you increase your Image, Improve PHC education, get higher quality employees, increase industry awareness, build long lasting friendships all while having fun. Visit the Auxiliary tab for Auxiliary membership information. We are here to help you - just call the PHCC office at (402) 761-2216 or email: staff@phccne.org to hear more about PHCC of Nebraska. PHCC has put together a photo album of photos from the events. 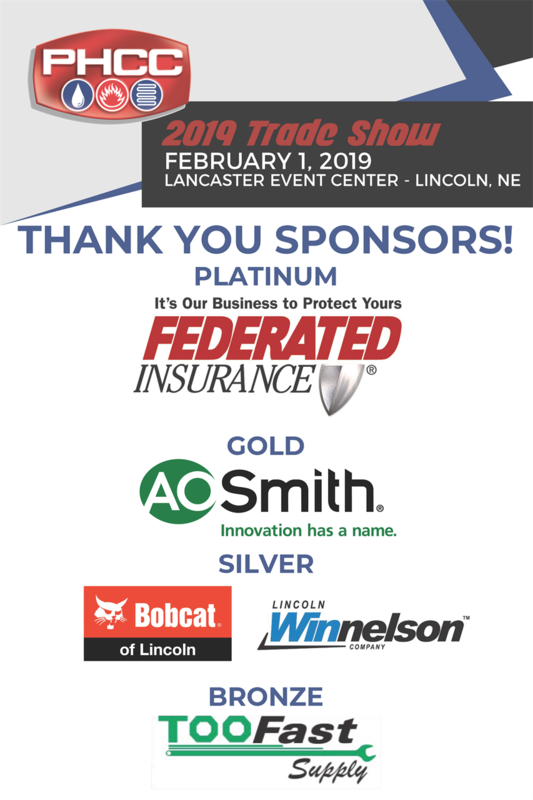 Thank you for attending and we hope to see you at this event in 2019.Click here to see the full album! Visit the Leadership Page of the website to see a full listing of the Board Members and Committee Chairs. 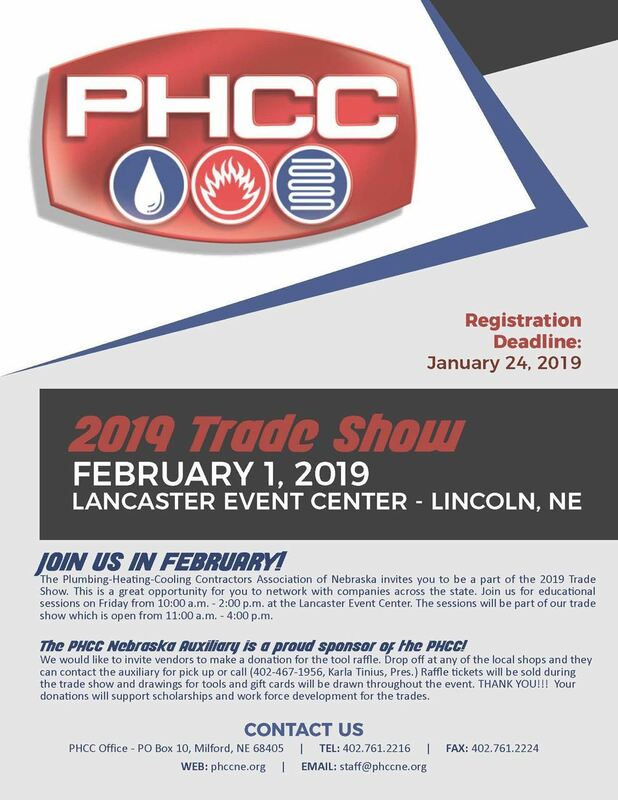 The PHCC Trade Show will be held February 1, 2019 at the Lancaster Event Center in Lincoln, NE. Click here to see Trade Show Brochure. The 2020 Scholarship Application is available by clicking here. Please review the application for eligibility requirements. The application period for 2020 is open. PHCC is excited to announce that SCC will be offering a new Plumbing Technology Program beginning in 2019. PHCC members have worked with SCC in the development of the program. Please visit the school's website for additional details.